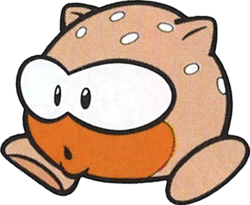 Wanderin' Gooms are small, oval-shaped creatures that appear in Wario Land: Super Mario Land 3. They have no arms, are not aggressive, and have no ability to attack. Although affiliated with the Black Sugar Gang, these creatures are extremely weak and are harmless. A Wanderin' Goom normally walks in a straight line, but upon coming into contact with any object, it would flip onto its back. Wario can defeat these defenseless creatures any way he sees fit. A single Wanderin' Goom appears in Game & Watch Gallery 2 as one of the objects Wario has to juggle in the modern version of Ball. Kurikuri "Big and round"; also possibly a reference to 「クリボー」 Kuribō, Goomba's Japanese name, or an indirect reference to 栗 Kuri chestnuts, which they resemble. Wanderin' Gooms have unused sprites spitting a projectile, but they do not attack in the final game. The back of Wario Land 3's box states that Wanderin' Gooms appear in the game, but they are nowhere to be found. It is likely that this refers to Spearhead or Para-Goom. ↑ "Be wary of Wanderin' Gooms, Hammer-bots, Mad Scienstein and more as you plunge into one of the largest, most dazzling adventures ever to hit Game Boy Color!" Back of the North American Wario Land 3 box. This page was last edited on January 3, 2019, at 02:53.